The Pere Marquette/C&O/CSX Railroad Bridge, which crosses the Grand River at the southern tip of Island #3, is located just north of the Wealthy St. Bridge. The small gap between the river and the bridge, and the height of the water on the trees show the severity of the flood. This bridge was built in 1902 as a swing Pratt truss bridge to allow steamboats to enter the steamboat channel and dock on the southern edge of downtown Grand Rapids. Amtrak trains use this bridge when they approach the Amtrak depot at Wealthy and Market, just east of the Grand River. 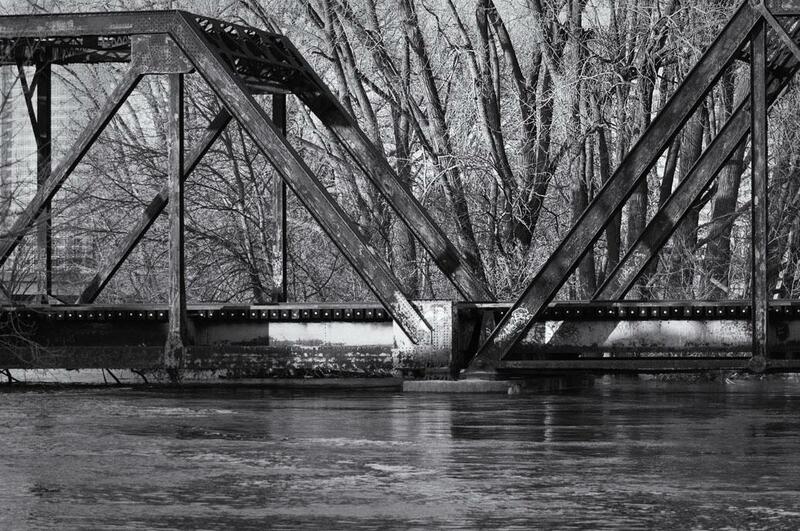 Read more about this bridge and other railroad bridges spanning the Grand River. The patent for Island No. 3 was registered in 1841 by Richard Godfroy. Louis Campau applied for the rights to Islands #1 and #2 in the same year.